This is NOT a current litter, but is an example of variation in color in puppies ... although they are all fairly dark, the two in the middle have no brindle markings, so they will lighten into some shade of wheaten. The two on the outside have brindle markings, so although they will lighten the first year or so as they get bigger, they will eventually darken into some shade of grey and continue to darken throughout their lives. An example of rapid growth in IW puppies...the puppy on the right is 4 weeks old while the puppy on the left is 10 weeks old. 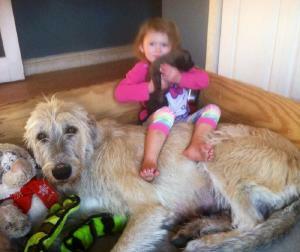 Because a singleton puppy has no littermates to snuggle with, this puppy has an adopted "sibling" for comfort. 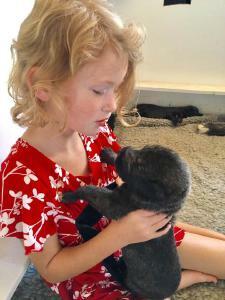 Charm at 2 weeks. Although certainly a great and protective mother to her puppy, Nuala knows and loves our granddaughter, McKenna and has allowed her to visit in the whelping box with her previous puppies as well. Yellow, Purple and Pink (you cannot see her collar, only her tail in the bottom left as she is buried under two brothers) lightened into beautiful wheatens. 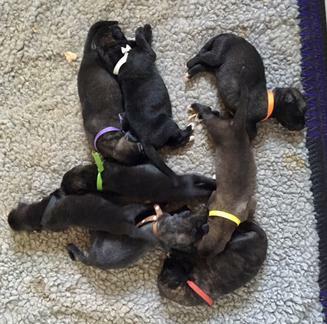 The other five siblings were dark brindle and will eventually become various shades of grey to almost black. Irish Wolfhounds have the most rapid rate of growth of any breed of dog during the first six months of their lives. It is common for a male puppy to go from 1# at birth to 30# before the new owner receives him at 10-12 weeks of age to 100# by six months of age. During this time, proper nutrition and careful exercise and management are CRITICAL for optimum physical and emotional development. It is vitally important for wolfhound puppies to receive lots of correct and frequent socialization to new sights, sounds, smells, locations, animals and people. This is not a good breed choice for busy people where everyone in the household works or attends school away from home many hours each day. If you want a wolfhound, but are not at a place in your life when you can invest much time, energy and money to your new puppy, then perhaps you should put your dream on hold until you can.